It seems that global climate change is becoming predictably more unpredictable every year. That’s especially true in fragile regions like the Arctic where even small changes in temperature or precipitation can have big effects on the ecosystem. 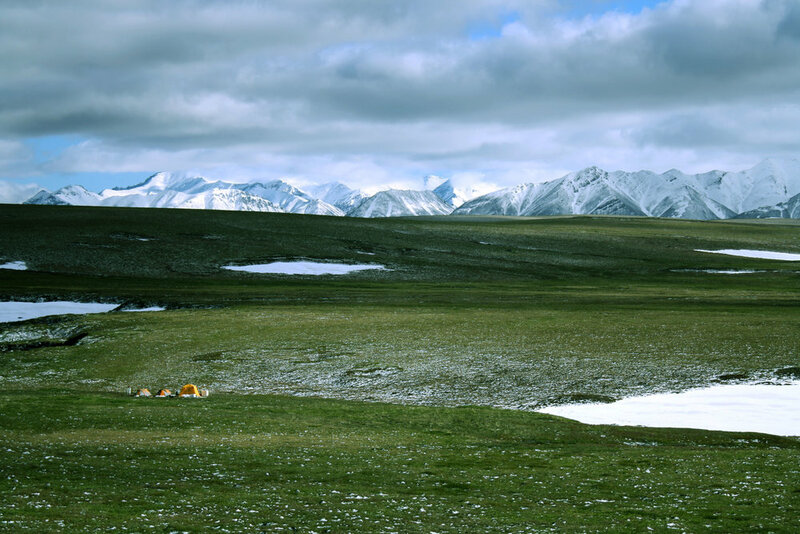 When Mark Urban and his team of biologists arrived in the foothills of Alaska’s Brooks Range last May, for example, they were disconcerted to see tundra green and not the lingering snowfields of winter. The spring thaw had begun unseasonably early. The scientists faced logistical hurdles to hurry to their field sites along the upper Kuparuk River and nearby watersheds where they are studying the effects of climate change on a species of fish called Arctic grayling (Thymallus arcticus). “It’s so hard to plan. It’s so hard to know what’s going to happen next. It’s very hard to predict what’s going to happen next season,” noted Urban, who co-wrote an editorial in the New York Times with Linda Deegan earlier this year about the abrupt and alarming changes that they have witnessed in the extreme northerly reaches of Alaska. “In some ways, [unpredictability is] becoming everyday life,” said Urban, an associate professor at the University of Connecticut. He is principal investigator (PI), along with co-PI Deegan of the Marine Biological Laboratory (MBL) at Woods Hole Oceanographic Institution, on a 3-year, NSF-funded project to track the seasonal migration of Arctic grayling in an environment becoming increasingly more difficult for the fish to maneuver as warmer summers bleed the streams dry during critical periods. “At some point, you stop becoming surprised,” Urban added, of what he and Deegan dubbed the Heat Age in the NYT piece. They just happened to arrive on the hottest May ever in the 91-year record for Alaska’s North Slope in what would turn out to be the hottest year ever for the planet in the modern meteorological record. The average temperature last May on the North Slope was nearly 9 degrees Fahrenheit (4.9 degrees Celsius) above normal. “There are indications that things are warming up now rather than later,” said Cameron MacKenzie, a research assistant with Deegan’s lab at MBL. Such abrupt and rapid changes make it more difficult for the scientists to do their jobs—both logistically and scientifically. Lack of snow and the fragility of the tundra mean researchers must use more expensive means to reach remote field sites—catching rides on helicopters rather than using snowmobiles to move equipment and people. More challenging is the effort to understand and eventually predict how grayling will respond to a changing climate when the baseline is already shifting positions faster than a politician in election season. Nobody is overly concerned that Arctic grayling, a circumpolar species, is in any danger of extinction. However, the fish serve as a key species in the region, and local extinctions or changes in individual fishery populations could affect the ecosystem in that area of Alaska’s North Slope. In particular, the fish play a vital role in linking deep-water habitats where they overwinter in lakes to the streams and tributaries where they migrate to breed. “The seasonal migration of the grayling acts as a subsidy to these lakes,” MacKenzie said. In other words, after the Arctic grayling feed and fatten up as they migrate to and from their breeding grounds, they return to places such as Green Cabin Lake off the upper Kuparuk River where deep water serves as a winter refuge. A relative of salmon, Arctic grayling are food for lake trout, and their poo is a much-needed nutrient that stimulates the nutrient-poor food web of the freshwater Arctic ecosystem. But warmer summers are temporarily turning streams like the Kuparuk—where some populations migrate as far as 50 kilometers—into dried-out boulder fields. That’s not a problem until winter approaches, and the Arctic grayling need to return to deeper water to avoid freezing to death in the shallow streams. In August 2011, during a previous phase of the current project, known as Fishscape, a lingering drought caught thousands of fish on the wrong side of a dry section of riverbed. A typical 2-day journey from the summer habitat to the lake took the Kuparuk grayling on average 30 days to complete. The stranded fish “were subjected to extra stresses from increased predation, crowding, and loss in accrued mass over the summer because invertebrate production shuts down in the fall,” MacKenzie said. Mother Nature helped out when the first snowfall of the season re-flooded the stream just in time for the stranded grayling to retreat back to Green Cabin Lake. The team is able to monitor the grayling using remote-sensing data received from passive integrated transponder (PIT) tags, which track the movement of individual fish as they pass by a far-flung array of antennas along the shore. The team is also using other methods to tell the life story of Arctic grayling in the waterways of the North Slope. For example, genetics can speak to the connectivity within and between watersheds based on genetic differences among grayling populations in different locations. In addition to the Kuparuk River, the new phase of the project encompasses two other stream systems—Oksrukuyik Creek and the Itkillik Tributary. The former experiences more extreme conditions—in 2011, 271 grayling trapped between dry areas on the creek died—while the latter is well connected to headwater lakes and the main Itkillik River. Understanding the genetic variation between the populations in these watersheds is much more than an academic exercise, according to Urban. It is an important step in understanding how populations move, mingle (or not), and meet different challenges. For instance, are some populations more resilient to water temperature changes? “We can dive down in this history book in the DNA and see the effects of past migrations,” Urban explained. “There’s pretty strong genetic variation.” The genetic work is being led by Heidi Golden, a PhD student at the University of Connecticut. Another method of investigation involves scanning grayling otoliths with a laser to look at the composition of the fish’s ear bones. Studying otoliths is a bit like reading tree rings. Instead of recording a year-to-year environmental record, however, the ear bones contain chemical tracers that can be matched to specific water chemistry of a stream. Urban said the effects of climate change can be more easily quantified in terms of changes in temperature, precipitation, and even sea-level rise. The more complex questions involve how individual species and populations within a species will handle threats to genetic diversity—if not survival. “Trying to understand these effects to nature are really important because they can also have profound effects on the services nature provides humans,” Urban said.